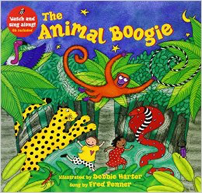 Set in an Indian rainforest, Animal Boogie is a colourful picturebook with a tuneful rhyme which you can read aloud to your child, sing together and even dance! There is lots to talk about in the colourful illustrations, including playing spot the animals hiding in the jungle. Read or sing the rhyme to your child. Children will enjoy hearing it more than once, lots of times in fact! The more often you share the book, the more familiar children will become with the words in the rhyme; you can encourage them to join in as you read or sing. As they become familiar with the book children will notice more in the illustrations too. Once you both know the rhyme well you can have fun saying it together even at times when you don’t have the book, for example at bathtime or during a car journey. Talk about the pictures, what can children see? Can they spot the bear, monkey, elephant and other creatures hiding in the jungle? What sounds would you hear in the jungle? For example the ‘tap, tap’ of the woodpecker, ‘buzz, buzz’ of the bees. You could make these sounds together. Look at the double page spread at the back of the book together and then have a go at dancing an animal boogie, you can copy the actions in the book or make up your own: shaking like a bear, stomping like an elephant, swaying like a parrot. This is more fun if you do it together! You could use animal puppets or soft toys to sing and dance the animal boogie too.